The CBM is designed to provide comfort by supporting the motion of the seated passenger. This system is user activated without motors. 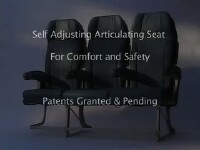 CBM aircraft seating video in QuickTime format. AEC has several new and optimized CBM dynamic seat designs for aircraft passenger seating utilizing arcuate motion, thus complementing seat mechanics to body dynamics. The aim of the CBM seat is to improve comfort, safety, weight, space, cost and style. CBM aircraft seating video in Windows Media format. Copyright 2015 American Ergonomics Corp.